Every year around this time I start to see posts about embracing summer, making it magical for your kids, saying yes, and so on. And every year I’m torn between rebellion and guilt. It’s not that I disagree with this in principle (although I think our kids have a pretty magical life in general and I’m not a huge fan of the idea of being their cruise director); it’s just that it’s very hard to pull off when I am working full time and we live 30-45 minutes from everything. We honestly didn’t even do a very good job on last year’s simple bucket list because the activities either involved driving somewhere or lots of direction from mom. For us, then, a spectacular summer becomes less about the places we go or the things we do together and more about intentionally providing inspiration and tools for fun activities that the girls can do themselves. 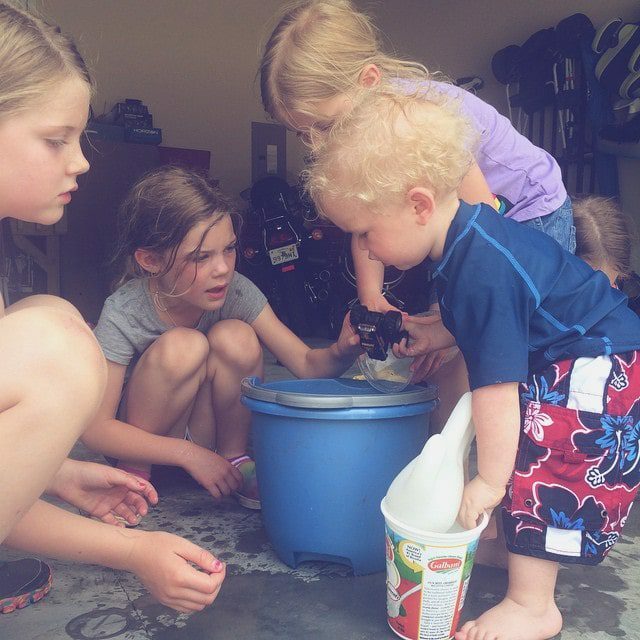 As much as I might want to be, I’ll never be the mom that surprises my kids with a tub full of water balloons on the last day of school or who packs everybody up for daily or even weekly trips to the pool. 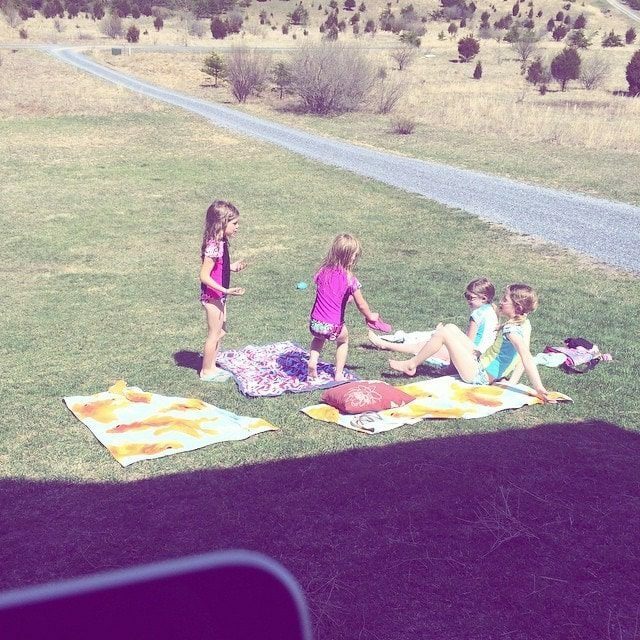 But I can be the mom who provides lots of ingredients and ideas for homemade popsicles, who buys the water balloons and hands over the package for the kids to fill up, who finds them a recipe for homemade moon sand or goo and makes sure we have all of the supplies on hand to make it. I can be the mom who lets them browse through my lists of summer activities to choose a couple to try each week, who says yes to a kitchen experiment or messy activity, who lets them stay up late to watch a movie just because. I can be the mom who serves breakfast on special paper plates because each day is worth celebrating, the one who records American Ninja Warrior and then lets the kids set up their own obstacle course (ahem, within reason), who pulls out the buckets and sponges and lets them wash the car on a hot day. I might not be able to say yes to everything, but I can say yes to a garden (even with the brownest brown thumb around) and let them be in charge of caring for the plants and harvesting the fruits and veggies. I can say yes to skipping school work on beautiful days or rainy days or middle-of-the-week days. I can say yes to family walks and pancake dinners and building forts. Oh, and—in full disclosure—we can also be the parents who decide to invest in an above ground metal-frame pool for what is already shaping up to be a super hot summer now that the girls are all old enough to get in by themselves while I supervise from the kitchen. Our plan is to set it up one night while they’re sleeping for the ultimate summer surprise! 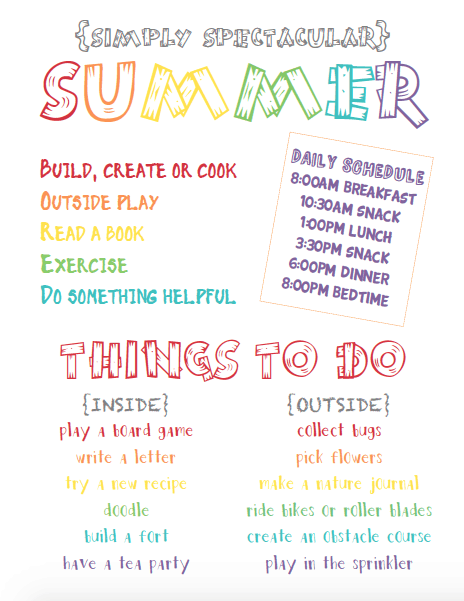 I recently came across this cute “Summertime Agenda of Awesome” from Kelli Stuart. I love that it provides inspiration for the summer—for the simple and the spectacular—and so I made us our own agenda of sorts. The girls were so excited when they saw me working on it on the computer that they started writing their own, and they’ve memorized the list of things to do when you’re B-O-R-E-D already! Click here to download or print the simply spectacular summer agenda. Is a magical summertime important to you? How do you do it without making yourself crazy? Why I tell my girls they’re beautiful. Often. I loved this! It can be so hard when you see things on Pinterest or you see what your friends are doing. But it looks like your kids will still have a magical summer. And thanks for the encouragement as a fellow WAHM. Wonderfully put, Mandi! I love this that we don’t have to do it all. We can choose our activities and still make summer wonderfully memorable for our kids. They are going to love the pool surprise, I’m sure! Plus, aren’t we all better for having down time and the freedom to choose and plan our activities? It’s a necessary skill that all kids – and adults – need to develop! Nicole, absolutely—I fee lucky every day to be able to do a job I love *and* be home with my kids! Yes! I am no Pinterest Mom either, but exploring, swimming, reading, biking, gardening, cooking, baking, building, etc., is totally me! This will actually be my first summer working full time from home and having my son old enough to fend for himself a little more he’s a “first grader” now and so he’s very excited to take on more responsibility! I’m a little nervous about balancing it all and not feeling guilty one way or the other. This is what I wanted and I have been setting my business up for this exact summer! So I will take all of the advice I can get! Love the post and the printable! PS My son is an only child so I have to be that hands on mom even when I feel like I don’t have time. This is me too, but my son is just going to be kinder age. He can be high maintenance even though I’ve tried really hard to work on quiet/independent times and to make sure he gets a lot of social engagement. I want to pick up more clients and work a little more but it’s hard to envision right now with my son being so needy. It sounds like one more year might be the time.